Professor Mike Hough has retired from the Institute for Criminal Policy Research after serving for more than 20 years as its Director. His ICPR colleague Gill Hunter writes about Mike’s retirement presentation and shares some of the insights amassed during his career. On 8 March, 2018, the ICPR, Law School, Birkbeck hosted a retirement event for Professor Mike Hough. Mike was Director of ICPR for 23 years (ICPR has been at Birkbeck since 2010), and before joining academia in 1994, he was a senior researcher in the Home Office for 20 years. His presentation – Making Justice Policy Listen to Criminological Research: Experiences of Speaking Truth to Power – drew from a long and distinguished career in criminal policy research to offer his reflections on the vagaries of achieving research impact but also the politics and ethics of policy research. Mike has held over 100 research contracts and has some 300 publications. He sought to identify – and to share with us – the ‘magic ingredients of impact’ by reference to examples of his own work which have attained policy traction and others that, in his words, ‘sank with little trace’. 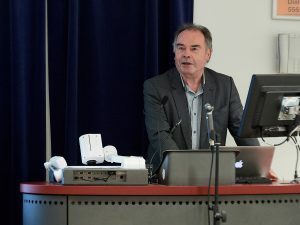 As a policy researcher, Mike has seen impact as being not only about academic citation – although he is a researcher of international renown and has made a significant contribution to the field of Criminology – but how, and in what ways, his research has been able to positively influence justice policy and practice. While having research impact beyond academia is now ‘measured’ in the Research Excellence Framework, there are numerous hurdles to achieving this. Mike’s move from Home Office to academia in the mid-1990s was instigated by his desire to carry on doing policy research but with greater freedom, and the late ’90s was a boom time for policy research. Mike was a beneficiary of some of this plentiful Government funding and contributed to programmes of research firmly in the tradition of liberal reform – more of which below. However, as he highlighted, there are ethical issues when one is in a position to secure large amounts of public or charitable trust money that may affect public policy, and a government can choose to accept or ignore research that doesn’t tally with its political vision. He noted the fine balance between making compromises when reporting critical research findings to funders and of being compromised, and described this often laborious negotiation process as a largely neglected craft. The British Crime Survey (now Crime Survey of England and Wales) has had enduring impact as a reliable indicator of crime trends. This had scale, was novel and had access to policy power through its location in the Home Office. Research into problem drug-use was committed to the idea that encouraging dependent drug users into treatment was better policy than punishing them. This was done at a time of increasing Government investment in drug treatment, but relationships frayed with Government’s move to mandatory treatment and its over-claiming of success, which reduced scope for independent research. Research on public attitudes to sentencing and penal populism provided good evidence that there wasn’t a monolithic punitive public, and that sentencing practice wasn’t wildly out of kilter with people’s sentencing preferences. Research on the sentence of Imprisonment for Public Protection (IPPs) played a part in the abolition of this unjust sentence. This programme of work had traction with senior judiciary and was assisted by the Prison Reform Trust who secured access to politicians and senior policy advisors. Research into public trust in the police. One well-funded study charted falling public trust in the Metropolitan Police, attributed to perverse effects of numerical targets. This work lacked a good conceptual framework, policy allies or interest from senior police managers but it did lay the foundation for later work on procedural justice theory which has had a significant impact on policing ideas in the UK. Through these examples Mike emphasised his lessons for achieving impact as: having something noteworthy to say that is based on research done on a significant scale, within a coherent conceptual or theoretical framework; timing; working with NGOs who understand the policy process; cultivating non-academic allies, including within Government; knowing how to amplify your voice through the media and contributing to the parliamentary process. Last, but by no means least, is building strong collaborative working relationships with academic and policy colleagues. Some of these longstanding colleagues, including Gloria Laycock (Professor of Crime Science, UCL), Ben Bradford (Professor of Global City Policing, UCL), Juliet Lyon (previous director of the Prison Reform Trust and Visiting Professor, Birkbeck) and Julian Roberts (Professor of Criminology, Oxford University) paid tribute to Mike and encouraged his continuing contribution to criminal policy research. Mike is currently a Visiting Professor in the School of Law.